Double Dog Rescue Shirts are Back for the Holidays! Everyone loves a Two-for-One gift! 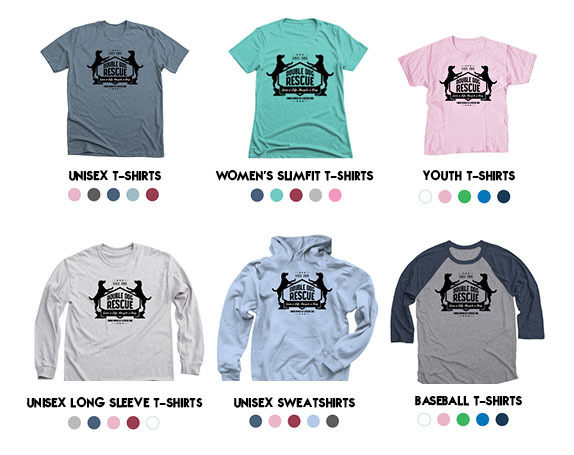 NOW you can buy any T-shirt or Sweatshirt and a portion of the proceeds will help save more homeless and unwanted dogs. CLICK HERE to buy your shirt today! Offer ends December 10, 2018 so gifts will be ready by December 24, 2018. Double Dog Rescue holds many adoption events throughout the year. Because we are a network of volunteers and most of our dogs are in foster homes scattered throughout the state, meet and greets are usually held separately from other dogs at the location and discretion of the foster. If you are a potential adopter who would like to meet several dogs at once, then attending one of our adoption events is the best option for you. If you are pre screened and pre approved before you attend an event, you are eligible to take an adoptable dog home, as long as it’s a good fit for you and your family. If you are not pre approved prior to event, your application will be reviewed once the event is over and there will be no promise that the dog you were interested will still be available. If you would like to get pre approved please contact our Pre-Approval Coordinator at preappddr@gmail.com. Whether you want to adopt, volunteer, or just walk around, adoption events are always fun to go to. Everyone and all the dogs are just so happy. It’s especially heartwarming when you actually see the dog getting adopted by their family. If you’d like to send used or new toys to dogs bored and waiting in their kennels, here are a list of shelters you can mail to. We will be adding shelters daily as soon as we get confirmation from the shelters that they accept today. Include blankets or old sheets too if you’d like!